Click on the Mail Box to send me a note! Give me a click and I'll put you on our electronic mailing list for new products and locations where you can see one. 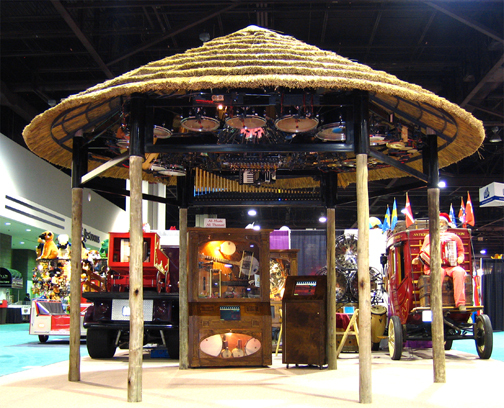 Below is a photo and videos of our Baila Maria built for the IAAPA show in Atlanta 2006. This one was sold to a Cutomer in Holland and is in his hotel. Take a look at this page to see how they mounted it. Photos and videos will be uploaded as I receive them. Ragtime Clients and their Location videos. The BailaMaria2 playing Russian Songs. 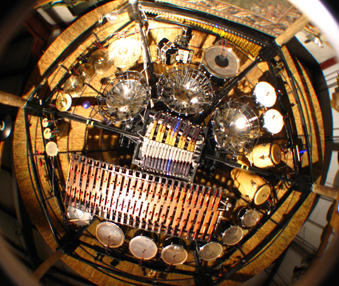 For 2007 we built a Baila Maria and installed a 49 note concert rosewood marimba and mounted it upside down above the floor. Awesome. Here is a fish eye lens photo and a few videos. Send $15 for our 64 page catalog. Make sure that you bookmark this page now and watch it for frequent uploads of our many other instruments (about 57 separate instruments to date!). Mail to Ragtime, 4218 Jessup Rd. Ceres, CA 95307 U.S.A.